Violence and masculinity is a normalized discourse of human interaction despite it being disruptive and toxic for individuals and socio-political interactions. Around the world, violent actions, either organized violence by states or non-state violence against civilians, have been fostering fear and causing damage to social and political fabrics of nations. Organized violence is largely regulated and practiced by militarized institutions of state and non-state actors. Developing on the theoretical work of RW. Connell regarding different forms of masculinities and their translation into socio-political interactions of societies, I will analyse the self-representations of masculinities and violence in the recruitment videos of the US army and Islamic State (ISIS) soldiers. 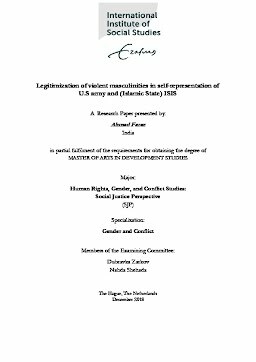 My focus will be on the role of religion in defining masculinities and violence in ISIS recruiting discourses, and on the role of nation-hood in defining masculinities and violence in US army recruiting discourses. I am also interested whether there are similarities in ISIS and USA military discourses, and if so what these are.